Calculations can take some time, so it’s best to use a separate thread to prevent blocking of the UI. When I faced this problem, I found a lot of articles with examples of only basic use of the DiffUtil class to calculate how a whole item has changed. But the DiffUtil class can also update just parts of an item. I decided to write this article to show you how to update only a specific part of an item asynchronously. To show my vision for how to overcome the challenge of UI blocking, I created a sample project. It’s a simple app that contains one screen with a list of timezones and the current time in those timezones. Each list item shows a timezone name along with hours, minutes, and seconds. Every second, the app gets the current time from different instances of the Calendar class and updates only those TextViews that have changed. Now we can inherit from the base class to implement the usual adapter with a minimum of code. Another benefit of this approach is the ability to focus on the main logic of the DiffUtil class. const val HOURS = "HOURS"
const val MINUTES = "MINUTES"
const val SECONDS = "SECONDS"
You can choose to output the result as any data type. The schematic below explains how the DiffUtil class compares lists. val set = payloads?.firstOrNull() as Set<String>? Payloads contains information you can use to update only one part of an item. If payloads is empty, you just need to call the super method and it will invoke onBindViewHolder(VH holder, int position). This method contains the logic to perform simple data binding to an instance of ViewHolder. onBindViewHolder(VH holder, int position) is invoked only if you call super on onBindViewHolder(VH holder, int position, List<Object> payloads). 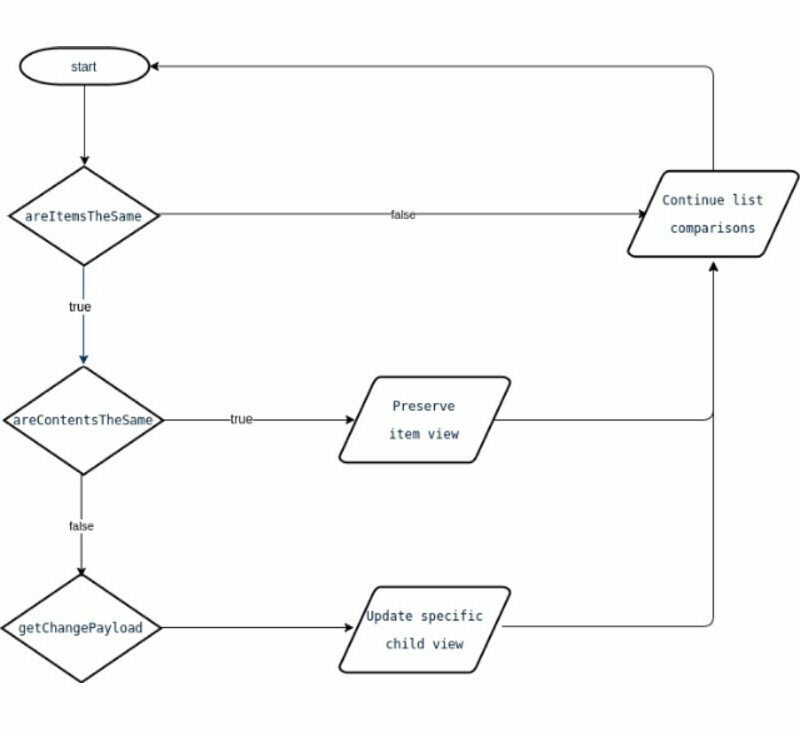 The DiffUtil class is a useful tool that allows you to use RecyclerView simply and correctly. It’s easy to use and it handles all logic of complex calculations. Using DiffUtil, you can prevent many bugs and make your code clearer. You can also make DiffUtil asynchronous using, for instance, RxJava or the default Thread class. Our sample project processes large amounts of data, and DiffUtil deals with this data pretty quickly.